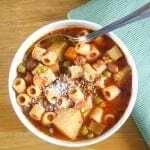 Italian Minestrone Soup, an easy delicious and healthy vegetarian soup recipe. The perfect lunch or dinner comfort food dish. Add all of the above ingredients in a medium to large pot and bring to a boil, stirring to mix, lower heat and simmer (very low boil) for 20-25 minutes, stirring occasionally. The last 5 minutes, boil 1-2 cups of water in a small pot, to the large pot add the boiled water (1/2 or all depending on how thick you like it) and 1 cup of small uncooked pasta, (I used ditaloni but you could also use spaghetti broken into small pieces, if you use the spaghetti use only 3/4 of a cup). Remember at this point check for salt. Cook on low boil, uncovered, stirring often till pasta is al dente. Top with freshly grated parmesan cheese if desired. Buon appetito.